Colombo – Consular and diplomatic officials can often play a key role in identifying, assisting and protecting of victims of human trafficking. In Sri Lanka, where tens of thousands of people work abroad, the Ministry of Foreign Affairs recognizes that their staff are often the first point of contact between Sri Lankan trafficking victims and the authorities, and need the skills and knowledge to identify, assist and protect victims. IOM, at the request of the Ministry, this week launched an e-learning course on Identifying, Assisting and Protecting Victims of Trafficking to build the capacity of Sri Lankan overseas missions to deal with and respond to trafficking cases. 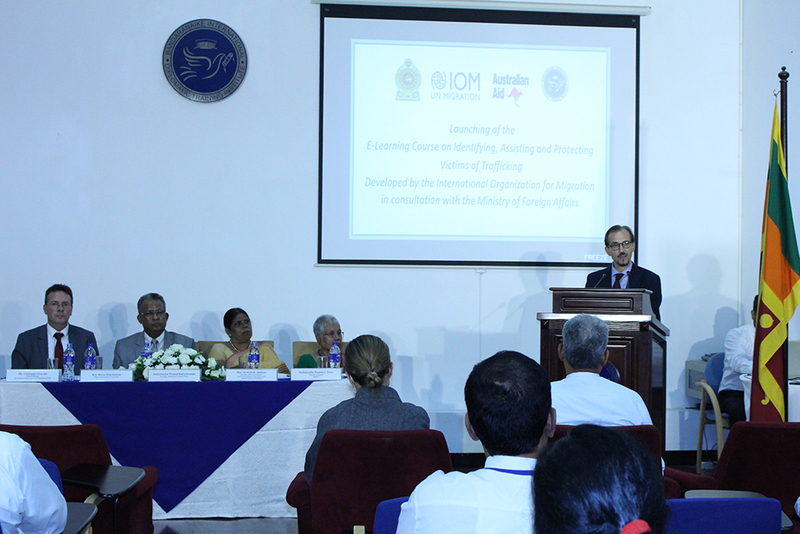 The course will also improve the Sri Lanka’s overall capacity to report on country-level trafficking in persons data through bilateral and multilateral channels, according to IOM Sri Lanka Chief of Mission Giuseppe Crocetti, speaking at the launch of the course at Colombo’s Bandaranaike International Diplomatic Training Institute. The initiative, funded by the Australian Department of Foreign Affairs and Trade, is part of a broader counter-trafficking project implemented by IOM in partnership with Sri Lanka’s National Anti-Human Trafficking Task Force. “The Australian government is pleased to be partnering with Sri Lanka in this initiative and has a deep co-operation with Sri Lanka in this space as part of global efforts to end human trafficking,” said Australian High Commissioner to Sri Lanka Bryce Hutchesson. The course has seven modules including an introduction to human trafficking; the legal framework; identification of victims; interviewing victims; protection of victims; roles and responsibilities of consular and diplomatic personnel; and case studies. It supports the implementation of the Standard Operating Procedures for the Identification, Protection and Referral of Victims of Human Trafficking. “This course has been designed to help diplomatic and consular personnel to respond more effectively and sensitively when they encounter potential victims of human trafficking in the performance of their functions,” said Secretary, Ministry of Foreign Affairs Prasad Kariyawasam, emphasizing the importance of international cooperation in successfully fighting human trafficking. W.M.M.R. Adikari, Secretary, Ministry of Justice and Chair of the National Anti-Human Trafficking Task Force, who also attended the launch, noted that the course will also strengthen Sri Lanka’s efforts to investigate and prosecute suspected traffickers.